Skyblivion Armour and clothes, tutorial for conversions included. I'm in the process of converting clothing, below is a spreadsheet which shows which converter is claiming what and shows what's been done. Clothing pictures will be added to OP soon, most of it has been converted, but not in-game yet. HorseRider has been doing Beast race helmets, I'll be updating the post with pictures as I get them. The ears on the Khajiit are HorseRider's personal preference and will not be in the mod. It can be removed through the slot on the armour in CK. I made a tutorial for converting armour, if anyone wants to help convert clothes or armour. Or just see what the process involves. I also made a video tutorial that goes with the written tutorial, hopefully this clears things up. 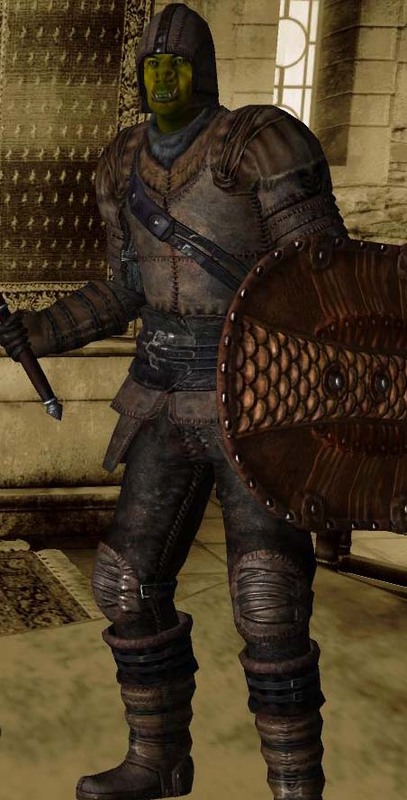 Are greaves, sleeves and cuirass combined as in Skyrim or still separate like in Oblivion? Im also curious about the armor and if its seperated like oblivion or not. The armour is like Skyrim, the greaves and torso are in one piece, and have the same stats as the Skyrim counterparts if possible. I'll give an example of this process using Amber Armour as an example. The Amber Cuirass and greaves combined gives a defence of 9.25, Daedric Cuirass (cuirass and greaves) in Oblivion has a defence of 30. So then I would get Skyrims Daedric Cuirass, which has a defence 49 and minus %69.17 percent to get 15.11 (15.1067 rounds up) as the defence stat for Amber armour. Would this be the most accurate way? Let me know. I'll leave stats calculations up to you. But since armors are combined now, need to write some script to remove duplicates from leveled lists and inventories. The armors look good, how did you over come the scaling issues, and are you planning on converting all the armors? I had this conversation with Alexander B, he said it would be easiest to combine greaves and cuirass like Skyrim. Also, if I were to have greaves and Cuirass as separate pieces, I can't guarantee mixed armours won't have clipping issues. But I can guarantee that armours of the same set will not have clipping issues. Is the script hard to write? Sorry for the inconvenience. What do you mean by scaling issues? Size differences? Stat scaling? I am planning on doing every single set, both genders. Will take a while. I tried getting the armors converted as well, but the difference in scaling was not fun to work with. Take for example the helmet, the Oblivion helmets and heads do not match the Skyrim ones, plus man and woman have different scaling as well. To make things worse every helmet had a different scaling to the others, I did a few but then gave up. Just curious how you managed to overcome those issues? I'm using 3DS max, I import the Skyrim Male head and then the Oblivion helmet I work with, Then I simply enlarge the Helmet and position it and then manipulate it. Your doing a really good job, I think zilav is very happy someone picked armor converting back up. Now he can finally add these back into the game. Writing script is not a problem. It will replace all sleeves and greaves with cuirasses of the same material, then remove remove duplicate cuirasses. Might break some converted mods doing this, but that can always be fixed manually. Having original armors (and clothes) will definitely make Skyblivion look more authentic. yazza2014 I don't want to push you, but don't forget the SI and DLC armors as well. I think the shields are already done, after this only the weapon sets remain. And don't forget the horses. Of course I'll include the DLC! I'll have to look into converting horse armour. Can horses in Skyrim wear armour? All weapons and shields are in game already, they have some minor visual glitches like wrong grip or wrong/missing blood splat mesh, but nothing serious or game breaking. Can you please convert clothes before looking into DLCs? Actually around 60% of NPCs are wearing clothes, not armors. I've attached a picture of the glitch, my export settings, and the nif file itself. I've seen this bug on previous armor conversion attempts, and nobody was able to fix it. Good job. Bad part is that I have to do this fix on all the armour I've already converted. Is anyone else converting armour? There were 2-3 other guys trying to convert in the past, but all left without much result. I've extracted this from two different copies of the same game. My screenshot of what I have as leather armour is attached. This is what it should supposedly look like. I can't find anything on wiki sites that looks like the leather Armour I have? Unless it's labeled different in game files, what is this Armour supposed to be then? This is arena armor, also leather. You get it as a reward when finishing arena matches. There are some mods for Oblivion that add it to leveled lists so bandits have a chance to wear it. Oh by the way, from your screenshot, make sure you have relative texture paths in models starting from "textures\". I believe this is actually part of the "Pit" armor set (search for "Pit Cuirass" here http://www.uesp.net/wiki/Oblivion:Other_Specialty_Gear), that doesn't exist in the gameworld at all, except for being in the testing hall. In vanilla Arena, you don't interact with it, although it was likely intended to be involved with the Arena. Apparently Leather armour is in the Thief folder, so are leather and thief the same? Can you PM me meshes of completed ones in PM if you are not going to tweak them anymore? So I can start adding them in leveled lists, inventories, creating unique outfits for npcs, removing duplicate sets, etc. I'm going to fix up all the armours I've converted first and then I'll send them to you. Also trying out Cube Maps, which can add a dull shininess or make armour fully reflective. It can be hard to notice in pictures, a video is need to show full effects of Cube maps. Yep, cubemap is visible even on screenshot, really nice. All Vanilla textures, Insanitys armory should work. I could make 4k texture packs for the Armour, but that's very time consuming. Makes the Normal maps extremely detailed. Not bad actually, I expected worse. But still hand made textures will always be better, especially when they are already exist. I've finished fixing all my current converted armours and put them all in-game. No more bugs, took me all day. Since I've already ported these meshes, expect to see pictures of the Following armour tomorrow (or the next few days). How many armors left actually? The ones from SI? It is indeed amazing to see how fast he is working. Plus the results in the screenshots is very nice. I wonder how he is actually doing the 3DsMax work. All by hand or does he have a magic scaling formula, to automate it all? Looks like some sort of Dark Magic to me.. In all seriousness its amazing to see how quick you are blazing though these with excellent results where your predecessors did not. I too cant wait to see how clothing turn out. But I have made references for female armour so that I can easily put them in-game without adding anything to the esp file. I do use some automation in 3DS max. I use an Oblivion Skeleton in a Skyrim pose to line up the Oblivion Armour, then I position the armour with the legs and hands and skinwrap it to the Skyrim body. Reason why it seems so quick is because I'm unemployed and spending all day doing this, and also I'm getting better at it. Okay so these sets below, I thought they would have the exact same meshes as Steel and Legion. Turns out they are slightly different and as a result the textures look weird on them.